This installation was subordinated to the site in the way it outlined the surface of the austere floor of the church of Santiago. A path of aluminum, provoked the passage of the people entering in that place. It touched the coarseness of poor materials and precious materials; the inherent concept emerged as a music appropriator, provoking the copyright from the DJ culture and the matrix of financial valuation of cultural institutions. Set in a festival of experimental music, with room for interpretation and reinterpretation in different spheres of music, the dialogue between musician and public institutions were quite present. 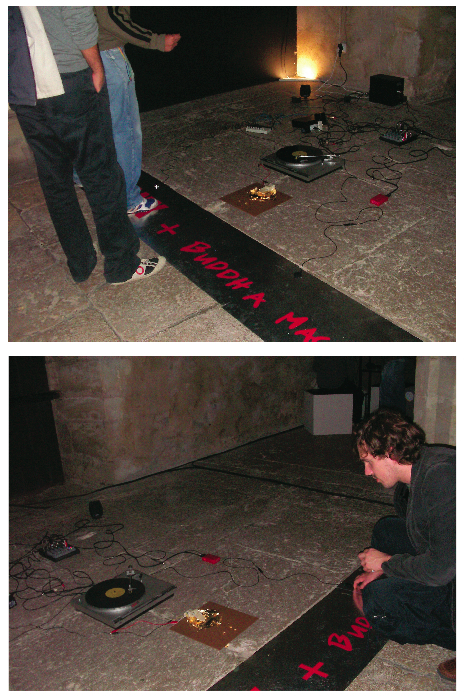 Stimulating that dialogue, anytime the public walked on the aluminum route, where words of red velvet BLANK + BUDDHA MACHINE were inscribed; the mix between the turntable and the buddha machine was activated by the steps of the audience on the aluminium. Blank is a vinyl designed so that each track on the disc, is an infinite loop, mostly addressed to DJs. The Buddha Machine is similar, containing recorded loops, developed to achieve a meditative mood. Both lead to the definition of ownership and authorship, carrying the iconographic DJ culture and New Media acquisition. Remixing themselves, overlapping loop with loop; as a hermetic system but infinitely random; this installation particularly questioned the valuation of the whole process of commodification of culture. Both “music devices” driven by purpose, a rough engine that was breaking, crushing, tearing a thin sheet of gold. Gold is clearly a symbol of richness and preciousness, misrepresented here for the copyright issue. After the event, the little pieces of gold, smashed during the three days of its duration, were offered to Vitor Joaquim, the curator and producer of the festival, for being the major presence in the cultural system within that festival.